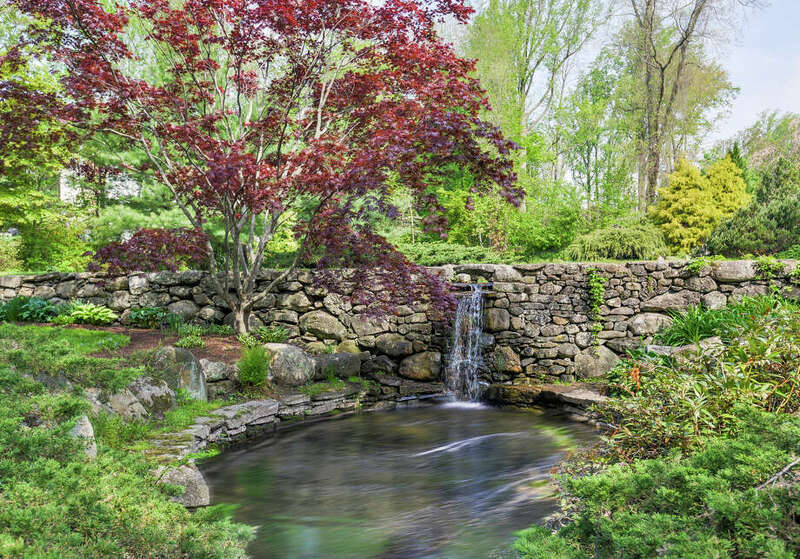 The landscaped grounds and gardens at 8 Peabody Lane in Westport have water features and lush plantings. Spring has finally made her presence known. Birds are singing with abandon and blossoms are bursting with color in gardens across Fairfield County. Those colorful displays may increase the value of a property and play a part in the sale of a house, according to local garden experts and realtors. "No matter what the price point of a property, gardens enhance your life and your home increasing value not only monetarily but, even more importantly, to your soul," said Julie Vanderblue, of the Vanderblue Team, an affiliate of Higgins Group Real Estate. A property on the market at 8 Peabody Lane in Westport definitely soothes the soul. Its grounds feature thoughtful landscaping designed to calm and relax. Landscape designers fashioned a rare, natural enclave on this 1.54-acre parcel on a private cul-de-sac in the Fairfield County Hunt Club neighborhood. It features waterfalls and Zen-like gardens to ease the spirit. The current owners have carefully tended and nurtured this special Eden. Lush and alluring, these gardens invite quiet walks and peaceful contemplation, according to listing agent Janet Anderson of Coldwell Banker. Then there is the Colonial with architecturally ornate and historic gardens at 5060 Congress St. in Fairfield's Greenfield Hill, which is also on the market. The stems of flowers in this historic garden may be standing straighter, their blossoms bursting with pride this season as the garden was recently recognized by the Smithsonian Gardens and registered in the institution's Archives of American Gardens, through the Garden Club of America's Garden History & Design program. The AAG preserves and highlights "a meaningful compendium of significant aspects of gardening in the United States for the benefit of researchers and the public today and in the future," according to its website. The garden at 5060 Congress St. on a bucolic estate called Farmwood is one of more than 7,500 gardens throughout the nation highlighted in the Smithsonian archive, which includes 100,000-plus photographic images and documentation related to historic and contemporary American gardens. Those records are important since "historic, designed and cultural landscapes are subject to change, loss and destruction," the website says. Images in the collection show views of gardens from the 1870s to the present and include features such as garden furniture, ornamentation, fountains, sculptures, fences and gates, many of which are found in the Congress Street garden. It is hidden behind stone walls and separated from the property's notable swimming pool by a lattice fence. Scenes for the film "The Swimmer" were shot at this pool as Academy Award-winning actor Burt Lancaster swam in it. The design styles represented in the Smithsonian garden archives range from large Italianate estates to herb and rose gardens, cottage and patio gardens, and urban parks. In a letter to the homeowners, a representative of the Smithsonian Institution's Archives of American Gardens said, "The documentation will help provide scholars and researchers with a much better understanding and appreciation of its history, layout and design inspirations ... `Farmwood' is one of thousands of gardens included in the AAG that reach a wide and varied audience. Researchers and the general public regularly access AAG holdings for scholarly and education purposes as well as for design inspiration." One of the owners of the Congress Street home is also a member of the Fairfield Garden Club and spent two years researching the background of the garden that the family reclaimed when they first moved in. Deer had taken over the garden, which was designed and built in the 1920s by the Fleischmann family. It was later purchased by Roy and Margaret "Margot" Larsen, who donated much of the land to the Connecticut Audubon Society. Larsen Sanctuary, which is open to the public, borders this property and will never see development. Jillian Klaff of William Raveis Real Estate said, dollar for dollar, homeowners rarely recoup their investment in gardens and landscaping, but added established gardens with specimen and other special plantings do add value to a property. If a property is not well maintained it will detract from the financial value and curb appeal is important, she said. For more information or to set up an appointment to see 5060 Congress St., contact Doris Rowe and Tara Rowe Hawley of Coldwell Banker Previews International -- Rowe at 203-767-0920 or rowehouses@aol.com, and Hawley at 203-331-5939 or tara.hawley@cbmoves.com. For more information or to make an appointment to see 8 Peabody Lane, contact Janet Anderson of Coldwell Banker Residential Brokerage at 203-226-1090. "The homeowners will definitely get less money is it doesn't look good," Klaff said. To learn more about the Smithsonian Gardens archives, visit www.si.edu.